Before the Segway, inventor Dean Kamen created a standing, self-balancing wheelchair called the iBot that gave users more independence and freedom. It also cost $25,000, and is no longer available. But a new all-mechanical alternative might provide the same improvements in quality of life for users, at a much cheaper price point. Created at the Minneapolis Veterans Affairs Hospital by Dr. Gary Goldish who consulted with a team of engineers to help perfect the mechanics, the wheelchair’s unorthodox design sees the hand-powered drive wheels separated from the wheels that touch the ground. Instead, the two sets of wheels are connected with a series of chains and gears like on a bike. 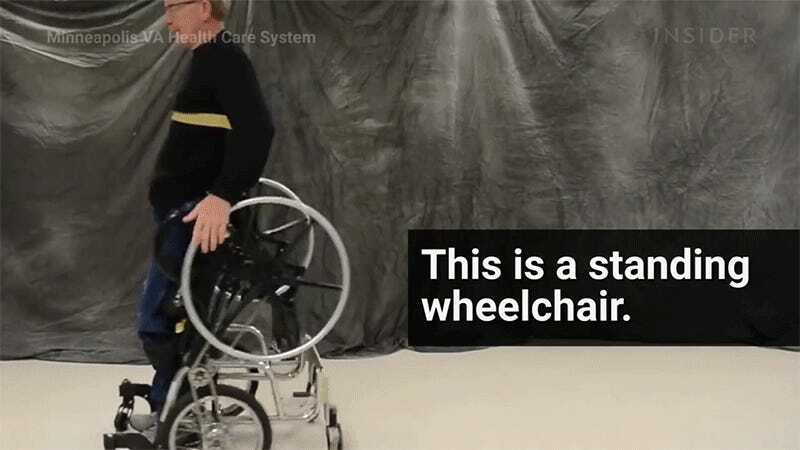 Using the same kind of gas-powered springs that make heavy car doors easier to open, the wheelchair can be transformed into an upright standing position by the user. And once converted, the hand-powered wheels remain at the user’s side so they can continue to propel themselves manually while befitting from a higher vantage point. Imagine how a wheelchair like this could make grocery shopping, and reaching items on every shelf, so much easier. For stability, the wheelchair has four wheels that remain on the ground at all times, in either mode. And because it doesn’t rely on electric motors, batteries, or any electronics to transform, the cost of building and maintaining the all-mechanical wheelchair will be significantly cheaper than electric alternatives. The Paralyzed Veterans of America provided the funding to help build the prototype, but its creators are still working on perfecting and refining its design before they move towards mass production and wider availability.